Kunos Simulazioni’s Licensing Project Manager Marco Massarutto published some more teaser previews of the upcoming Porsche DLC for Assetto Corsa. The new screenshots show us what looks to be the rear of the new 2017 Porsche Panamera (top image) and the rear angle of the previously teased 1974 Porsche 911 Carrera 30 RSR. Furthermore, Kunos Simulazioni’s lead programmer Stefano Casillo is working hard on the Assetto Corsa V1.8 update. 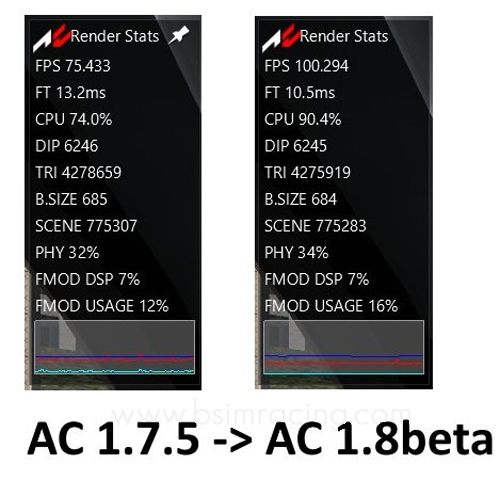 In one of his latest Tweets, he reported that he has made some good progress optimizing the performance of the Assetto Corsa game engine, resulting in a very impressive FPS increase. Assetto Corsa V1.8 is announced to roll out on August 26. We eagerly anticipate some more announcements to learn which other models will be featured in the Porsche DLC for Assetto Corsa.